We love chocolate. It makes a delicious standalone treat but it also goes well with so many other things. And when we combine chocolate and hazelnut, magic happens! 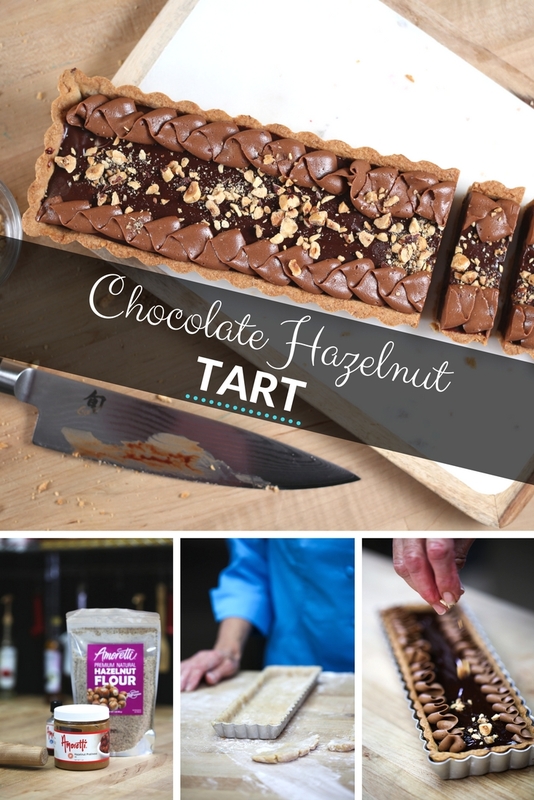 This chocolate hazelnut tart offers a perfect balance of creamy chocolate filling and crunchy toasted hazelnuts. It also uses both bittersweet chocolate for the filling and milk chocolate for the topping, so you’re really covering all the bases with this delicious treat. Enjoy it with a steaming cup of coffee as an afternoon snack or bring it to a dinner party to knock the socks off your friends. It takes a bit of planning and effort, but it’s truly worth it when it all comes together! Make sure you save this recipe and give it a try then next time you’re feeling an itch for some chocolate. Begin by making the topping first, as it should rest in the refrigerator at least 4 hours or overnight before whipping. Heat cream to almost boiling and pour over the milk chocolate. Let sit for 3-4 minutes before whisking to combine. Cover and chill for minimum 4 hours or overnight. Place ¾ cup hazelnuts on a sheet pan and toast in a 350°F oven for 8-10 minutes. Place toasted nuts in a towel, rub back and forth to remove as much of the skins as possible. For nuts to be used in crust, separate 2 tbsp and chop or pulse in a food processor until finely chopped. For nuts to be used as topping, chop roughly and set aside. Combine Amoretti Hazelnut Flour, AP flour, sugar, salt and toasted hazelnuts in a mixer fitted with the paddle attachment. Add egg and Amoretti Madagascar Bourbon Vanilla, mix briefly to combine. Add butter and mix until a dough is formed. Wrap and chill dough for 30 minutes. Roll out dough between 2 pieces of parchment dusted with flour. This dough is very sticky and will soften quickly, so the colder it is the easier it is to work with. Roll out to fit your tart shell. Lightly spray bottom and sides of tart shell. Place dough into tart shell, pressing sides and bottom to an even thickness. Chill 10 minutes in freezer. Place a piece parchment paper into the tart shell and pour in pie weights (or beans or rice) and bake for 15-20 minutes. Remove parchment and pie weights and return shell to oven for another 10-15 minutes. Heat cream and sugar to almost boiling. Pour over the bittersweet chocolate and Amoretti Hazelnut Praline. Let sit for 3-4 minutes so the chocolate can melt. Chill for 1 ½ hours. Stir topping before pouring into mixer, then whip to soft peak. This will whip up quickly, so keep an eye on it, you don’t want to over-whip it. Remove tart from refrigerator and, using a pastry bag fitted with a tip of your choice, cover the outer edges of the tart. Sprinkle the toasted, chopped hazelnuts down the center of the tart. Cut the chocolate into small pieces so it will melt quickly. Make the topping first. Preferably, the day before so it has time to chill in the refrigerator overnight. The dough is easier to work with when it’s cold. If you don’t have pie weights, use dried beans or rice.